Gloomth’s new “Chapel” dress is available now in our catalogue! 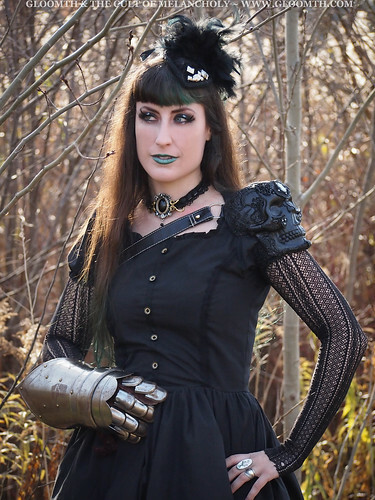 This dress is the perfect Gothic piece to suit so many outfits and styles. It has a faux front button closure with gorgeous wooden buttons with an intricate design carved in. The “Chapel” dress is available in our full range of colors (shown in black) with a choice of 3 kinds of lace trim! 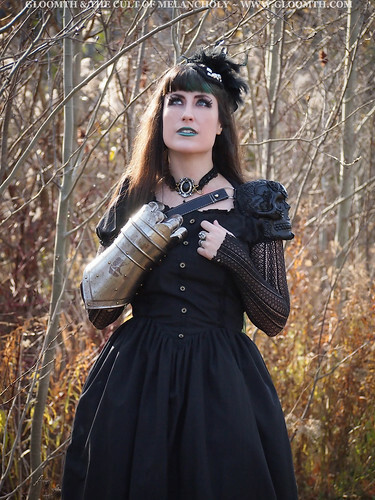 Shown modeled by Hexcelle here with a vintage steel gauntlet and an amazing skull shoulder-piece she made. The choker shown was provided by Alchemy of England, it’s their “She Walks in Beauty” design and it’s absolutely decadent. This dress has a basque style waistline which ends in a point at the front, and small puffed sleeves with elastic cuffs. $155 on our website now in sizes XS-2XL or custom made for $175 (including plus sizes). ← New “Nautical” Dress Update!